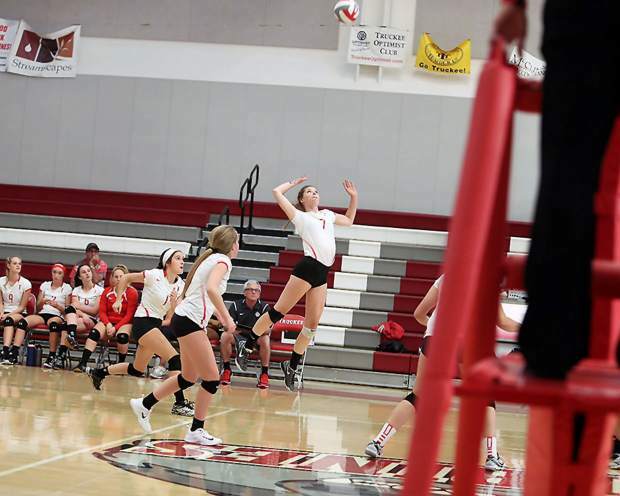 Former Truckee standout Madison Bromley was named the Great Northeast Athletic Conference Women’s Volleyball Rookie of the Week after leading the Chargers volleyball team to a 2-2 start. Former Truckee volleyball standout Madison Bromley made waves in her first week of competition at Colby-Sawyer College, leading the Chargers to a 2-2 record at the DeSales Invitational. For her play on the court, Bromley, a two-time Class 3A all-state outside hitter, has been named the Great Northeast Athletic Conference Women’s Volleyball Rookie of the Week. Bromley led the New Hampshire-based Colby-Sawyer squad with a team-high 2.5 kills per set (40 total), and was second on the Chargers with .38 blocks per set and 2.38 digs per set (38 digs). Bromley’s best performance of the tournament came against Baruch College. She posted 16 kills and a .317 hitting percentage to go along with 15 digs. Bromley’s play at the tournament also earned her all-tournament honors. Bromley and the Chargers will be back on the court Wednesday against New England College.